Is the energy crisis impending? Will we have to give up our cars? How high are the costs of climate change and climate protection? What does the conversion from fossil fuels to renewable energy cost? These and other questions have been keeping me busy for many years: as an environmental economist, scientist, researcher and professor for economics, as an international reviewer and advisor, author and editor. My topics concentrate on the economic costs of climate change, future energy security and the economic opportunities presented by an intelligent energy change. Since 2004, I head the department of energy, transportation and environment at the German Institute for Economic Research (DIW Berlin) and am professor of energy and sustainability at the Hertie School of Governance in Berlin. Besides scientific research, I advise politicians and firms and put my reports forward for discussion in the public media. My research results and the implications for consumer, forms and politicians are summarized in a book titled “Die andere KlimaZukunft” and “Jetzt die Krise nutzen”. 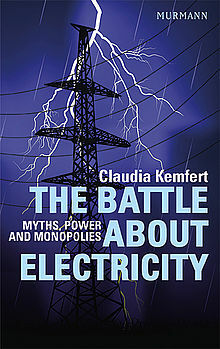 My recent book “The battle about electricity” deals with the Energiewende in Germany and the myths and fights around it.